This is going to make a great video game someday. 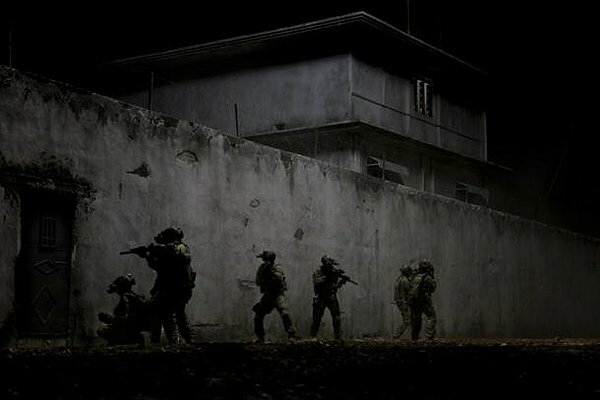 Zero Dark Thirty, about the decade-long hunt for Osama bin Laden, is a cinematic Rorschach test that any given viewer is bound to come away from with their own interpretation. Some will see the amoral exploitation of the torture inflicted by the CIA upon dark-skinned detainees inside concrete bunkers at clandestine black sites. Others may see a chronicle of the tenacious, even courageous personnel who brought justice upon the world's most wanted terrorist, Some will see a paean to feminism, while others will decry a movie—named for half past the witching hour—whose notion of strong, successful women are those most adaptable to man’s genetic bloodlust. Controversy has swirled around Zero Dark Thirty, from the level of access to sensitive intelligence allegedly given to director Kathryn Bigelow and screenwriter Mark Boal (allegations that both deny) to its depiction of torture (and its investigative value). There are brutal depictions of sleep deprivation by means of loud music, chaining a detainee in stress positions so long that he soils himself, and stuffing a prisoner into a small wooden box. But the fact is, torture was deployed repeatedly, and depicting its graphic nature is not only essential to an accurate telling of this history but is itself a form of condemnation for right-thinking viewers. The screenplay hints that vital evidence was occasionally obtained from the Bush-era torture program while recognizing the wholesale unreliability of intelligence extracted solely by such duress. Indeed, the film posits that it wasn't until the torture program was shelved and the intelligence community forced to shift focus and resources toward old-fashioned, boots-on-the-ground detective work that they finally achieved success. As a CIA operative newly deployed to one black site, Maya (Jessica Chastain) recoils at the sight of waterboarding during the film's opening scene. Although "Washington says she's a killer," Maya's killer instinct is that of an analytical assassin recruited by the CIA straight out of high school. Like many in Maya's generation, her age of innocence ended with 9/11, which set into motion a career motivated by the overarching aim of finding bin Laden. Maya is patterned after a real-life counterpart whose degree of contribution to the war on al-Qaeda is a matter of debate. Perhaps because of legal and ethical purposes, all the film's characters are fictionalized, even down to someone meant to be Leon Panetta (played by James Gandolfini) credited only as "C.I.A. Director." Bigelow's clinical approach creates a compelling procedural, but there's also a conspicuous lack of character development and emotional depth, unlike Bigelow's last film, The Hurt Locker, for which she won the Oscar for best director. The branch tasked with tracking bin Laden is depicted as understaffed and underfunded, but that doesn't mean its staff members aren't subjected to the weight of great expectations. Still, the geopolitical context of their mission is merely hinted at. The presidential transition from Bush to Obama only comes in the form of a TV interview in which Obama denounces the use of torture, a broadcast that plays in the background as intelligence operatives pay little attention to it. Otherwise, the tumult over the torture program only arises during a key conversation between Maya and her colleague Dan (Jason Clarke), a frequent purveyor of "enhanced interrogation techniques" who eventually accepts a transfer back to Langley to avoid being "the last one holding the dog collar when the oversight committee comes." Reportedly, Bigelow and Boal planned to film a far more open-ended version of Zero Dark Thirty that concluded with bin Laden's apparent disappearance into the mountains of Tora Bora. Then bin Laden was killed on May 2, 2011, and the filmmakers had to adjust their finale. 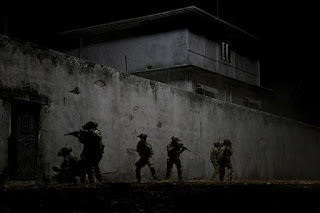 The result is a taut 30-minute final act chronicling the raid on bin Laden's compound in Abbottabad, Pakistan, one of the most gripping, compelling movie sequences of the year and where Bigelow should have nailed down another Oscar nomination. It's also noticeably distinct from the film's previous two hours, a more more detailed and deliberate recounting than the broader, comparatively disjointed perusal that precedes it. Nonetheless, Boal's screenplay opens and closes with acts of cold-blooded violence whose righteousness is left to the viewpoint and conscience of the beholder. The refusal of Zero Dark Thirty to take a moral stand mustn't be confused for immorality. And while this narrative about the search for Osama bin Laden is sometimes as muddled as the mission itself, its clarity of purpose is as steadfast as SEAL Team 6.